Over 3 million head of Texas Longhorn cattle arrived in Abilene between the years of 1867 and 1872, to be shipped east by rail. Tom Smith and Wild Bill Hickock became famous for their attempts to maintain law and order on Abilene's legendary Texas Street. As the railhead moved west and the cattle trade waned, Abilene businessmen became entrepreneurs in other areas and the community continued to grow. C.W. Parker operated an amusement company south of Abilene, manufacturing hand-carved carousels and carnival equipment. Dr. A.B. Seelye's patent medicine company was known across the country. C.L. Brown founded United Telephone Company, which later became Sprint. And President Dwight D. Eisenhower grew to manhood with his five brothers in Abilene. First-class museums showcase the lives of these men. Known as the Greyhound Capitol of the World, Abilene hosts the Greyhound Hall of Fame and National Greyhound Association Headquarters. 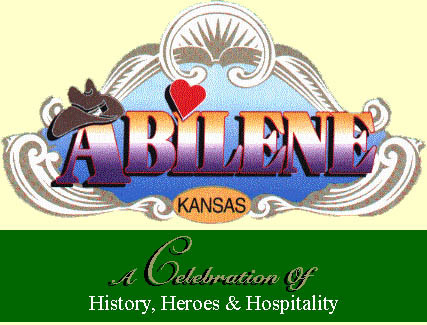 Abilene's history has been well-preserved in its quality museums and beautifully restored historic homes. A diverse economic base is supported by several manufacturing firms and a growing service industry. Thousands of visitors from around the world travel to Abilene each year to tour and shop in the growing number of antique and specialty shops. Listed on the National Register of Historic Places, the twenty-five room Georgian mansion was built in 1905 by A.B. Seelye, a patent medicine entrepreneur. Museum depicts turn-of-the-century medicine business. Winner of the 8 Wonders of Kansas Architecture! !